These are the four components included in an IFI Isaac 16 System Bundle, which is required by BBIQ for safety reasons. An operator controls the robot via command signals generated by various types of control devices, such as a joystick. The operator control device plugs into the IFI "Operator Interface" (OI) which is plugged to the "Radio Modem" (RM) transceiver. Data is sent from the RM to the "Radio Controller" (RC) through the air via radio waves. Helpful performance data is also sent back to the OI. The "Motherboard" (MB) is the brains of the group. 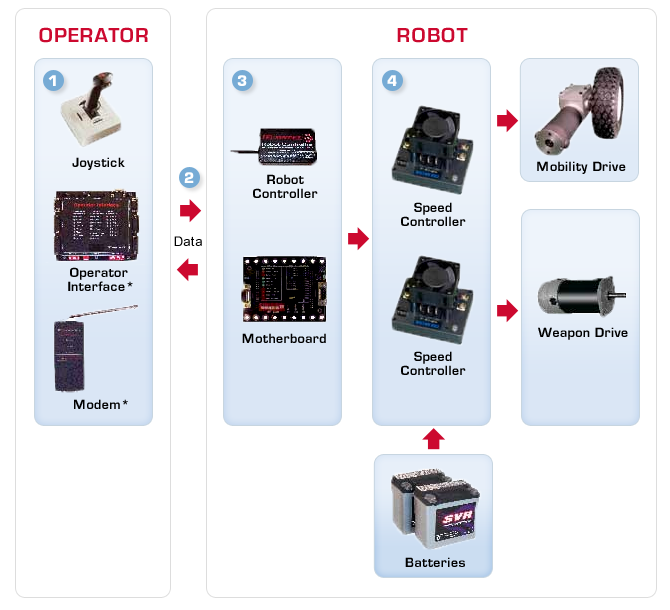 It translates the information/data from the RC and distributes the operator’s various commands to the appropriate component, such as a speed controller for mobility drive, a speed controller for a weapon, or a solenoid for pneumatics. High amp discharge batteries are wired to the electronic speed controllers (ESC). The ESC receives full battery power but distributes to a component only the amount dictated by the operator, i.e. fast or slow, up or down, left or right.